Turn your oven to 150°C/Gas Mark 2. Take a large mixing bowl and beat your eggs, then stir in the flour. Coarsely grate the potatoes and squeeze out any excess water using a tea towel. Add this to the egg and flour along with coarsely grated beetroot and chopped spring onions. Season with salt and milled pepper and mix everything well. Place a large frying pan over a medium-hot heat and add the groundnut oil. When hot take a heaped tablespoon of the latke mixture to the pan, flatten slightly so they are about 2cm thick and leave to cook until golden and crisp (about 3-4 minutes) flip over and cook on the other side until golden and crisp. Pop into the oven to keep warm whilst you prepare the second batch. When you have all 8 made you are ready to serve. 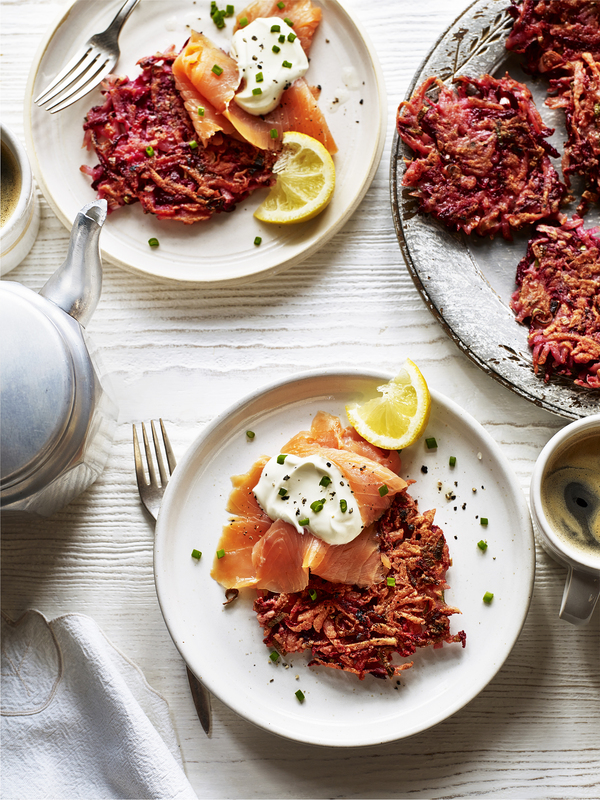 Place the latkes onto your serving plates, top with waves of smoked salmon and finish with a little crème fraiche, chopped chives and a milling of fresh pepper. Alternatives to beetroot that also work really well are: swede, courgette, mouli, parsnip or squash. "There’s nothing humble about this soup’s rich, creamy flavour – it tastes, remarkably, like mushrooms. And if it seems just a little too pared-back, it’s very easy to jazz it up with some nice finishing touches. Make sure the potatoes are well scrubbed before you peel them so the peels are very clean.